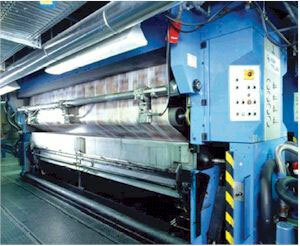 Gravure printing Process is a form of intaglio printing. The technique uses a depressed or sunken surface for formation of the image. The image area consists of honey comb shaped cells that are etched or engraved into a copper cylinder. The unetched area of the cylinder represents the non-image or unprinted areas. The cylinder generally rotates in a bath of ink called the ink pan. With the turning of cylinder, extra ink gets wiped off the cylinder due to a steel doctor blade. Image is formed due to the direct transfer of the ink to the substrate (paper or any other material) while it passes between the plate cylinder and the impression cylinder. This method allows multi color printing at very high speeds. Most machines are equipped with in-line die cutting, sheeting and perforating mechanism and have a high performance drying system. The machines allow for quick changeover features and sleeve engraving to make the printing economical.